It’s cold, snowy and icy outside for a lot of us, so we go and swap our summer tires for the winter ones. It’s the safe thing to do... on ice and snow. Things are a little different on pavement. Here at Jalopnik, we pound it into your head that if you’re going to do any kind of ice or snow driving, you’d better do it in a good set of winter tires. Not all-seasons. Winters. Winter tire compound just reacts better to the frozen conditions, giving you better traction. However! This is not always the case when it’s merely cold but dry on the road. When that happens, winter tires can actually be a detriment because they have much longer braking distances than summer tires do. Yes, even when it’s below freezing outside. 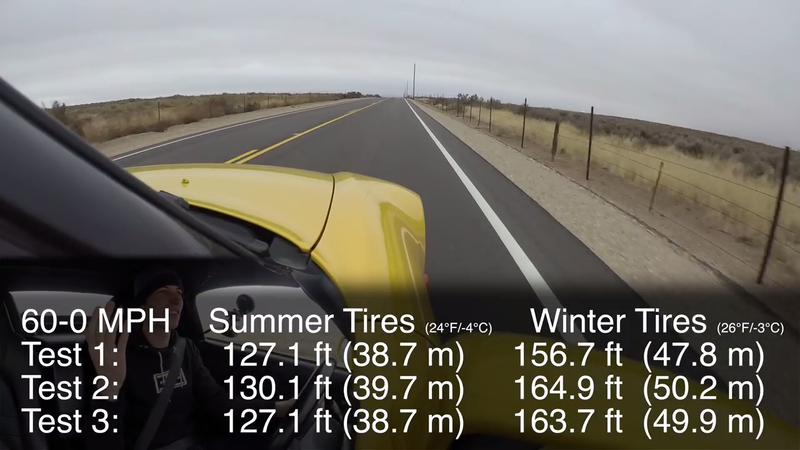 Jason Fenske of Engineering Explained recently took his Honda S2000 out to test braking distances in sub-freezing but dry temperatures with different sets of tires. The winter tires consistently yielded longer braking distances, leading him to conclude that if you live in an area that stays pretty dry in the winter, then you’re probably fine leaving those summer or all-season tires on your car. But, as soon as it gets icy, you might not want to drive around until it melts.